The Oakland City Council unanimously approved a lease agreement Thursday that allows the Raiders to remain in Oakland until the franchise relocates to Las Vegas, the final sign-off required for the document to be authorized. 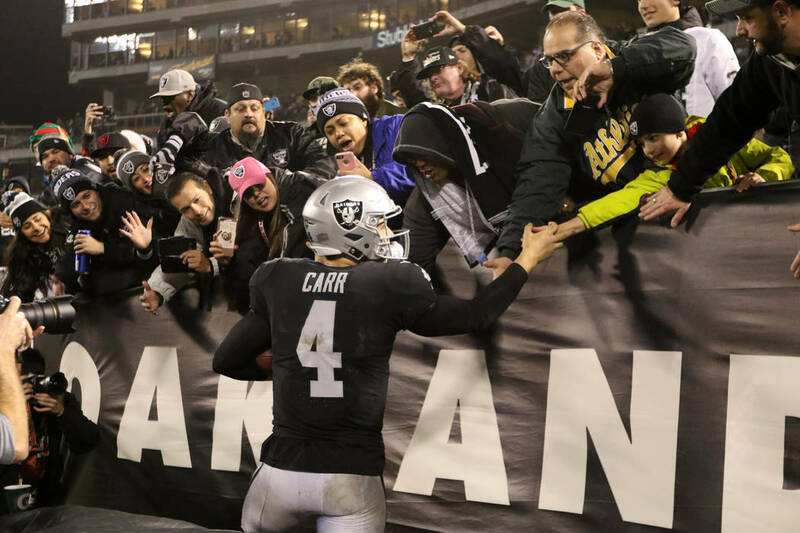 OAKLAND, Calif. — The Oakland City Council unanimously approved a lease agreement Thursday that allows the Raiders to remain in Oakland until the franchise relocates to Las Vegas, the final signoff required for the document to be authorized. The lease needed the approval of three panels; all three OK’d the deal without a dissenting vote. First, it was the Coliseum Authority, a committee comprised of representatives from the city of Oakland and Alameda County. It oversees the land on which the Oakland-Alameda County Coliseum resides. Scott McKibben, the Authority’s executive director, led negotiations with the Raiders on a deal featuring the team paying $7.5 million rent in 2019 and carrying a $10.5 million option in 2020. The option would be necessary only if construction on a $1.8 billion, 65,000-seat stadium in Las Vegas experiences a consequential delay. On March 15, the Authority delivered its anticipated vote, and the next public votes were considered a greater formality. The Alameda County Board of Supervisors and Oakland City Council provided a green light on Tuesday and Thursday, respectively. Raiders president Marc Badain declined comment Thursday. Owner Mark Davis is expected to address the development at the NFL spring meetings in Phoenix, Arizona. Those begin Sunday. It was Davis’ preference to stay in Oakland until relocation, although the club pursued alternative options after the the city of Oakland filed a federal antitrust lawsuit against the NFL and its 32 teams in December. This litigation and the lease ultimately were treated as separate matters. The Raiders filled one of two major voids on their offensive line Thursday, signing former Kansas City Chiefs center/guard Jordan Devey. His ability to play multiple positions helps mitigate the absence of Jon Feliciano, who signed with the Buffalo Bills last week via free agency. Devey, 31, can serve as the primary backup at center and both guard positions. Brandon Parker is expected to be the Raiders’ top tackle off the bench behind starters Trent Brown and Kolton Miller, who worked at left tackle in 2018 as a rookie first-round pick. It’s possible he could remain on that side despite Brown’s signing on March 13, although the team has not publicly committed either way. The Raiders’ next notable investment to their offensive line could be a starting guard. Denzelle Good projects as the starter today opposite Gabe Jackson, but the Raiders nonetheless are considered likely to draft someone to fill the role.They traded left guard Kelechi Osemele to the New York Jets this month amid internal belief Osemele should have missed fewer than the five games that sidelined him in 2018, sources have said. Osemele dealt with multiple ailments, including a knee sprain. Feliciano started four games in his place. In 2019, when a guard or center exits action, Devey instead could receive the first call. He started two games at center last season for the Chiefs, playing 134 offensive snaps all told before a pectoral issue forced his placement onto injured reserve. Devey spent the past three years with Kansas City. His first NFL action came in 2014 with the New England Patriots when starting four of seven games there. Nine of Devey’s 17 career starts were for the San Francisco 49ers at right guard in 2015.